Waynesville - Bill Raley, 84, passed away on Sunday, November 4, 2018 at Memorial Campus of Mission Hospitals. A native of Meridian, Mississippi, he was a son of the late James Harvey and Annie Gay Franklin Raley. In addition to his parents, he was preceded in death by a son, David Wayne Raley, who died in 1992. 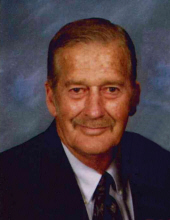 Bill attended Long Creek High School and enjoyed gardening and fishing. He was a member of Calvary Baptist Church. He is survived by his wife of 18 years, Judy Randolph Raley; one son, Richard A. Raley and wife, Deanna, of Waynesville; a sister, Mary Joyce Reeves of Quitman, Mississippi; a brother, Roy Raley of Meridian, Mississippi; and one grandchild, Reno Parker Raley. Funeral services will be held at 2:00 p.m. on Thursday, November 8, 2018 in the Canton Chapel of Wells Funeral Home with the Reverend Paul Murdock officiating. Burial will follow at Bethel Community Cemetery. The family will receive friends from 12:30 until 1:45 p.m. prior to the service at the funeral home.